Black Bears, Black Raiders should contend in tough KVAC. For more than a decade, the Kennebec Valley Athletic Conference’s control of Class B North (formerly East) was firm. Between 2001 and 2013, each regional winner came from the KVAC. Old Town snapped that run in 2014 and Ellsworth’s regional title last season gave the Big East two of the last three regional champs. This season, it looks like there is no clear cut favorite in the region once again, with neither conference holding a preseason edge. Browne’s Winslow team has a handful of seniors and a talented junior class. Gaining varsity experience will be the key. A trio of seniors — captains Spencer Miranda, Dylan Hutchinson and Keanu Earle — give the Black Raiders an athletic backcourt with strong shooters. While Winslow prefers to run and play in transition, Browne said the team has improved its halfcourt game and is playing better defense. Improving post defense and getting to the boards will be important if the Black Raiders are going to improve on last season’s 10-9 record. 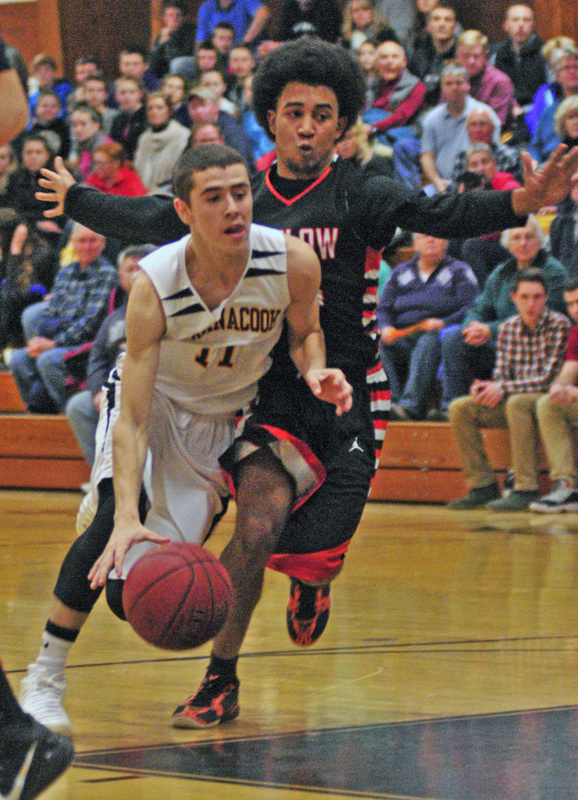 Maranacook’s return to Class B last year couldn’t have gone much better. Now the Black Bears will try to repeat their achievements, but coach Rob Schmidt will be the first to acknowledge how difficult that will be. They lost key players. B South is open and competitive. And a 16-2 season is never easy to repeat, no matter who’s back in the mix. The Black Bears lost Kent Mohlar, one of the class’s best players, but still return a pure scorer in senior guard Kyle Wilbur and another senior guard in Hayden Elwell, who is dangerous in transition and one of the team’s best defenders. Last season, Maine Central Institute reached the regional quarterfinals for the second consecutive season. With returning players to the backcourt and some new faces in the frontcourt, the Huskies will look to play on the Cross Center floor for a third year in a row. Coach Josh Tardy thinks senior guards Josh Buker and Carter Pearl can provide some scoring and help make up for the loss of Tre Grier, last season’s leading scorer. Senior Caleb Romanov also will contribute in the backcourt. Eli Bussell can play inside or out and do the little things. A pair of Spanish students — 6-foot-4 Angel Torrado Alvarez and 6-5 Jose Ignacio Montes Valverde — should contribute right away in the low post. Valverde projects as a starter, Tardy said. Losses in close games kept Mount View out of the tournament last season. The Mustangs lost five games by two points or less and finished with a 5-13 record. If the Mustangs can turn a few of those close losses into wins, they can compete for a playoff spot. Seniors Joey Danna, Colby Furrow, and Devon Davis will lead Mount View. At 6-3, Davis is the biggest player on a team that doesn’t have much size and will rely on athleticism and experience. Fundamentals such as boxing out and defensive intensity will be keys for the Mustangs, coach Chad Larrabee said. Oak Hill’s quest to improve on a 6-13 season rests in its ability to get the most out of its inexperienced players. Some key pieces come back in 6-4 senior center Marcus Bailey and point guard Evan Boston, but Oak Hill is young, and coach Tom Smith said they’re eager to take on a winning mentality.